First and foremost- make sure you are maintaining your good oral care routines at home, including brushing a flossing twice a day, as well as attending your regular check-ups with Beausejour Dental Centre to keep your oral health in top shape, and to be proactive and preventative with your oral care. After some root canal procedures, you may need to take anti-inflammatory medicine, or your doctor might prescribe you something to take to minimize your pain. Ice packs or cold compresses can significantly reduce pain and swelling after a root canal treatment, and you can repeat these compresses in an on-for-five, off-for-fifteen routine until you feel relief. Chewing might be painful, or could irritate your teeth and gums after treatment, so Beausejour Dental Centre often recommends a soft food or liquid diet until your mouth starts to heal. Smoothies, yogurt, and soup are all good solutions to help you get nutrients and prevent additional pain from eating. Gargling with salt water can also help soothe irritated teeth and gums, and can help minimize the risk of infection as the water gently cleans the affected area. Similarly, rinsing with a hydrogen peroxide and warm water solution will help disinfect your mouth. Sleeping with an elevated pillow can help reduce possible bleeding, and will help ease gum nerve pain as the blood is directed to flow in one direction. 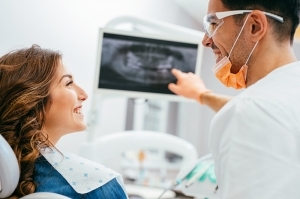 You will likely have a few follow-up appointment with Beausejour Dental Centre after your root canal procedure as to ensure all is healing normally and that there are no complications with your post-treatment care. Caring for your oral health after a root canal can be complicated and frustrating, so don’t hesitate to reach out to Beausejour Dental Centre of you have any questions or concerns following your procedure. For more information about root canal aftercare, or to schedule your next appointment with Beausejour Dental Centre, call 204.268.1782 today!